Schedule a check-up. With vacations, camps, and general care-free fun, summer’s not usually the time we take care of chores and preparations—it’s the time to enjoy the rewards of our hard work over the rest of the year. But when school starts back up, why not knock one more to-do off the list? Schedule an appointment for your kids to visit the dentist for one of their two annual cleanings and check-ups. In fact, if your child is seven or older, you may want to schedule a first consultation about orthodontics as well. Eat healthy lunches and snacks. It’s basically impossible to pack enough snacks in a school-age child’s backpack or lunch box. If you pack it, they will eat it. Instead of loading them down and sugaring them up with cookies, chips, and sugary drinks, pack healthy snacks—carrot sticks, fresh fruit, string cheese, and good cold water are kid-friendly and tooth-friendly. Protect against injuries. If your child plays sports after school, it’s a good idea to make sure they use a mouth guard. Even if you don’t want to splurge for a custom-fitted mouth guard from your dentist’s office, boil-and-bite mouth guards can offer significant protection if they fit properly. And since the little ones do grow quickly (and that includes their jaws), it’s best to replace them frequently to ensure the most protection possible. 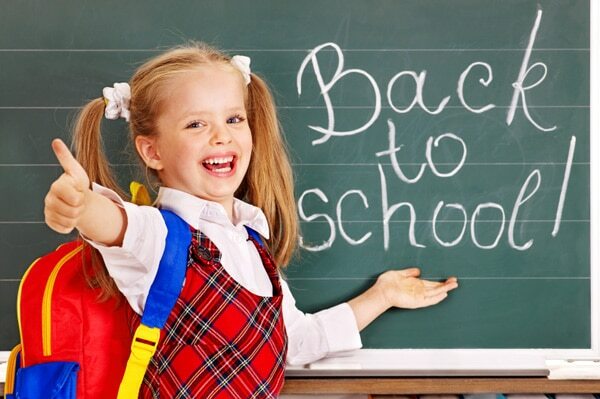 Hopefully these tips give you some ideas of how to integrate dental health into your back-to-school routine. Since our number one tip is to come in for a dental cleaning and check-up, why not request an appointment today?